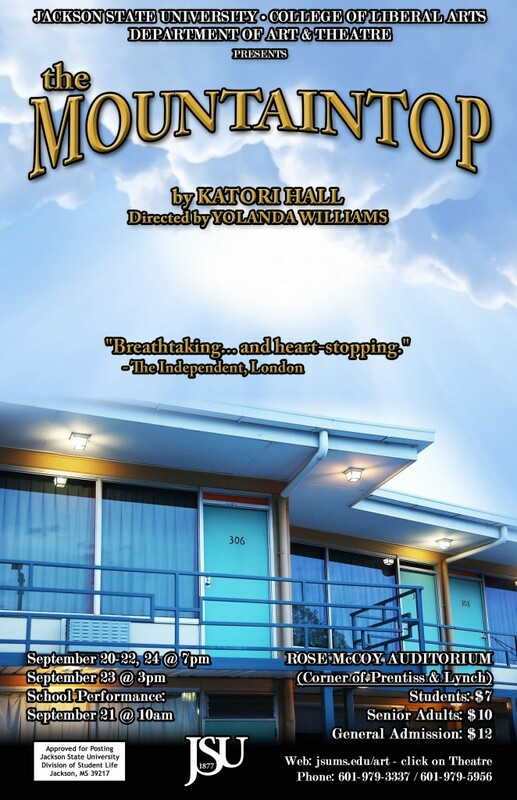 Jackson State University’s Department of Art & Theatre will host their first play of their 57th season when Mountaintop premieres on Thursday, Sept. 20 at 7 p.m. in the Rose E. McCoy Auditorium on the JSU campus. The critically-acclaimed production gives an engaging and fictional account of the last hours of Martin Luther King, Jr.’s life. Told from a surprising, poignant point of view audiences will enjoy, the piece is written by celebrated playwright Katori Hall and directed by Yolanda Williams. To purchase tickets, visit the JSU box office in the lobby of the Rose E. McCoy Auditorium at the corner of Prentiss and Lynch Street. Or buy your tickets online at www.jsums.edu/marketplace, and then click on Art & Theatre. It will be a memorable performance that shouldn’t be missed. *This play occasionally includes heavy language and it is recommended that children of a certain age be accompanied by an adult.